Vintage Hull USA Modern Art Pottery Wildflower Line Yellow And Pink Vase W-9 8-1/2"
Home > Vintage Mid-Century American Art Pottery > Vintage Hull USA Modern Art Pottery Wildflower Line Yellow And Pink Vase W-9 8-1/2"
Our beautiful Vintage Hull USA Modern Art Pottery Wildflower Line Yellow And Pink Vase W-9 8-1/2" was one of twenty two different items created in this same line from 1946 to 1947. The Wildflower line was part of Hull's Modern Art Pottery. This line was created in several two-tone, matte finish color combinations. The body of our vintage American art pottery vase has subtle gradation from the creamy pastel yellow top to the soft pink rose foot. 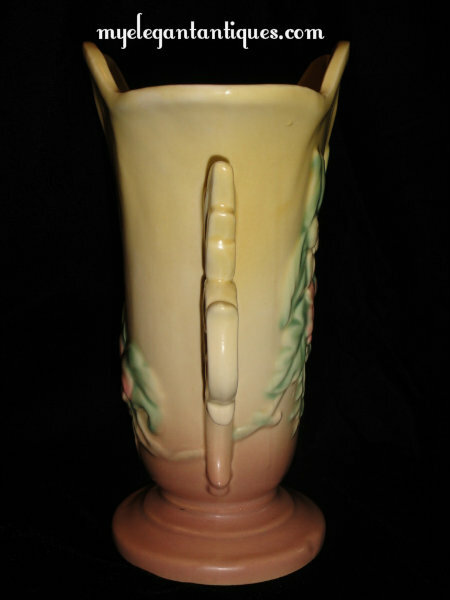 Our Vintage Hull USA Modern Art Pottery Wildflower Line Yellow And Pink Vase W-9 8-1/2" has ornate handles on both sides which are topped by large leaves. 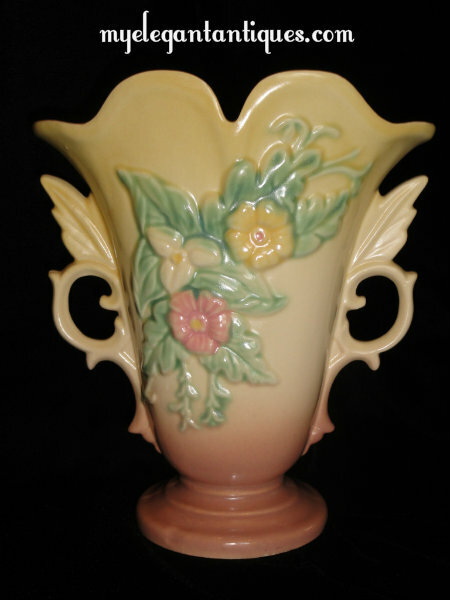 One side of the vase is decorated with a large embossed leafy spray which contains the following flowers: a yellow Trillium, one pink and one yellow Mission, and Bluebells which cascade along the edges of the bouquet. 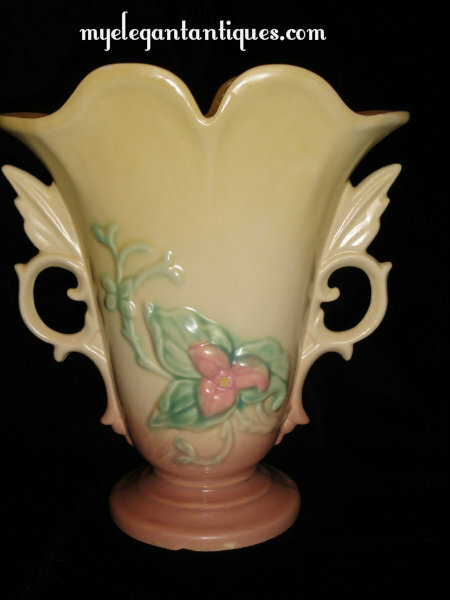 The other side of the vase has a similar embossment with contains one lone pink Trillium flower which ascends from the bottom of the vase. The vine which the flower is attached to continues towards the rim of the vase. The Vintage Hull USA Modern Art Pottery Wildflower Line Yellow And Pink Vase W-9 8-1/2" is marked on the bottom Hull Art U.S.A. W-9-8 1/2". The Hull Art U.S.A. stamp clearly denotes this piece as having been manufactured prior to 1950. The 'W' designates the Wildflower line. The number 9 is the mold number and 8 1/2" is the size. The artist's initial 'S' is also incised on the bottom. Resting on a round base measuring approximately 4" in diameter, the vase stands 8 3/4" tall, and measures 7 3/4" at its widest point of its mouth. The vase is in very good vintage condition. There are a few spots of rust colored staining on the inside of the vintage Hull art pottery vase, which I did not try to remove. 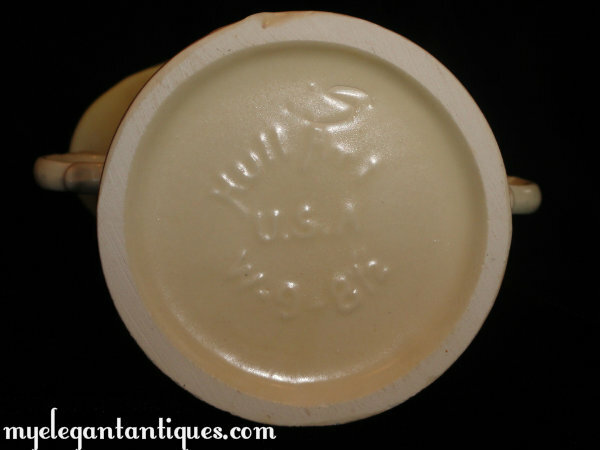 There is also a small flea bite along the top rim of the vase, on the side which only has the single flower spray. There is a kiln flaw on the bottom of the vase (a small dent where the piece came in contact with the kiln or another piece prior to firing). 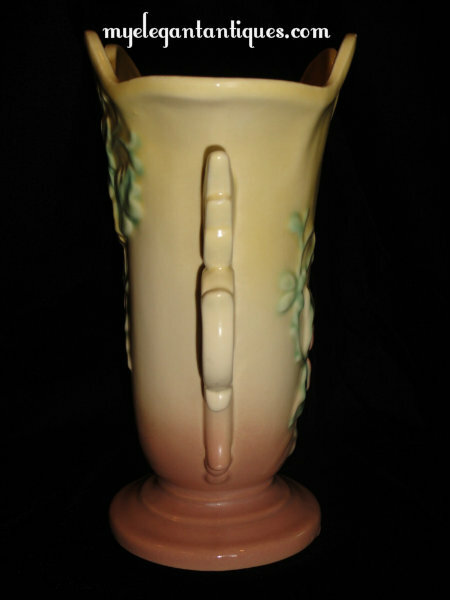 This vintage American art pottery vase has no cracks or crazing. Please see the pictures. 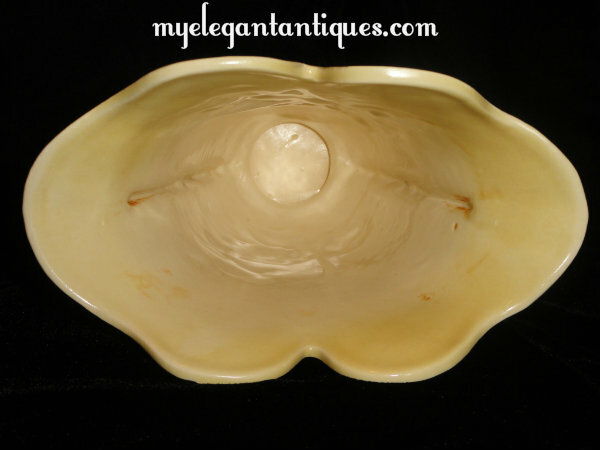 Created in a highly collectible color combination, this Vintage Hull USA Modern Art Pottery Wildflower Line Yellow And Pink Vase W-9 8-1/2" is a stunning example of Hull's pastel art pottery which flourished throughout the 1940's.